No small talk to open this one, cutting right to the chase. SO MANY more designers to cover. 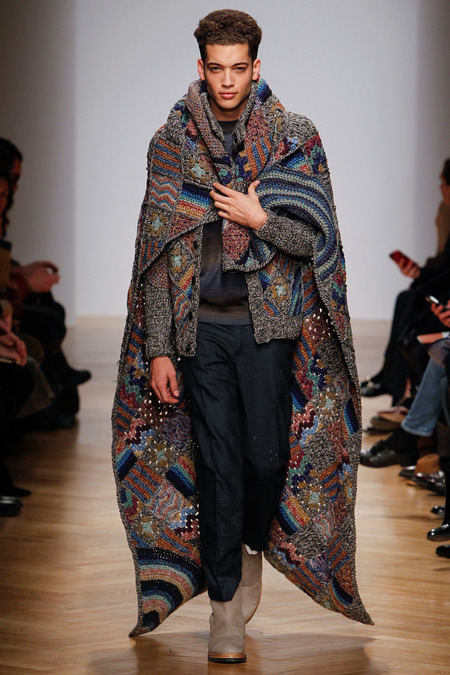 To be honest, there is so much to love from Missoni with such warm knits that become instant classics each season. But what we really loved from Missoni is this knit throw blanket!!! SO MANY patterns and colors, we can only imagine how long it took to construct much a masterpiece. Take my money! We have to figure out how to somehow replace a coat with this next winter. 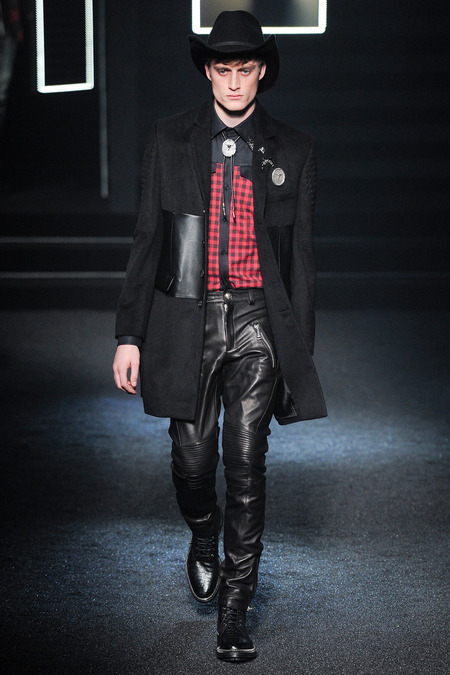 I hadn’t heard of Philipp Plein before checking out this season, but I really enjoyed the generous amounts of leather. I do honestly think the cowboy theme has been done and done to death but we do applaud any shot at re-interpreting it in their own way. The soft black snake leather jacket is so pimp. Really nice black leather paneled coat with shoulder detail. 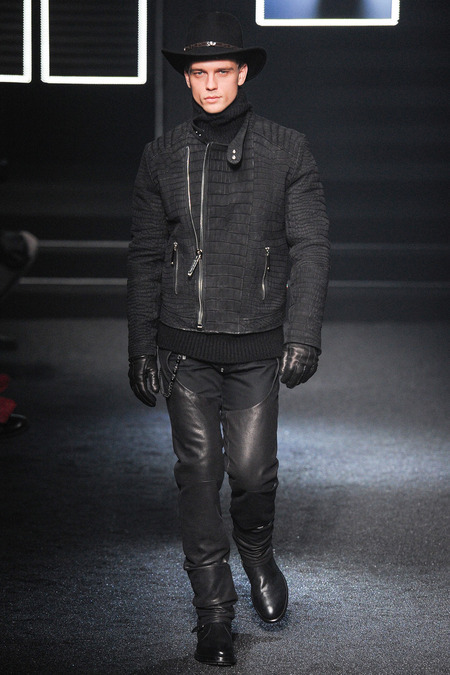 Again, a bunch of really good looking leather all around from Philipp Plein. Some really great layering going on at Andrea Pompilio with the red turtleneck layered underneath the white coat, underneath the padded vest, underneath the navy cropped jacket, underneath…..you get it. You get a ton of warmth without looking like a eskimo. 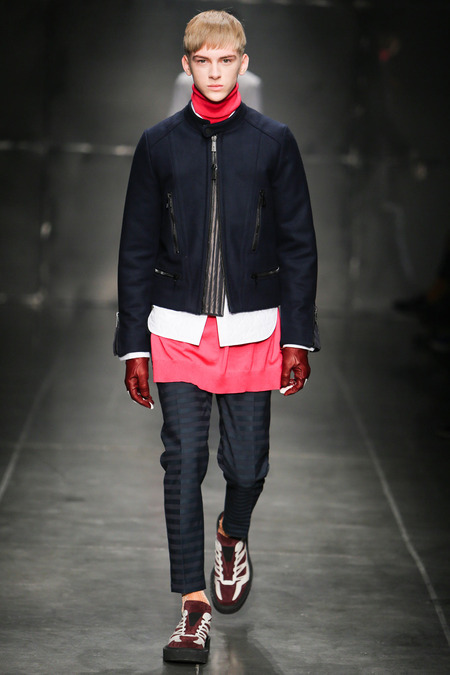 Usually, we try and stay away from looks that aren’t “ready to wear” in our eyes. 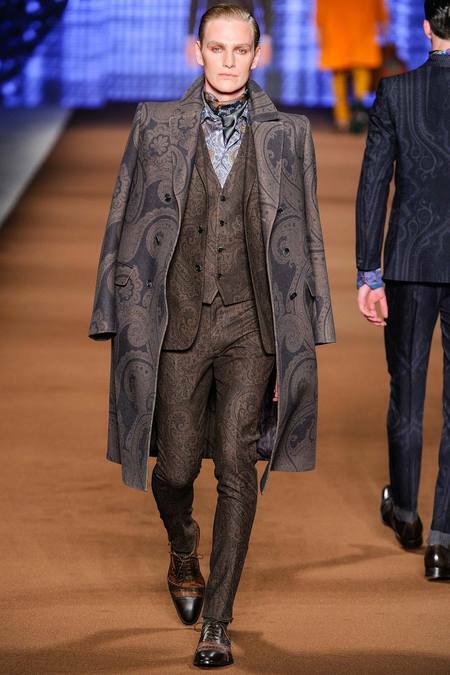 But take each piece here on its own and you really have really great paisley print clothing. Slim fit (not for everyone) is spot on and that overcoat is brilliant in every way shape and form! 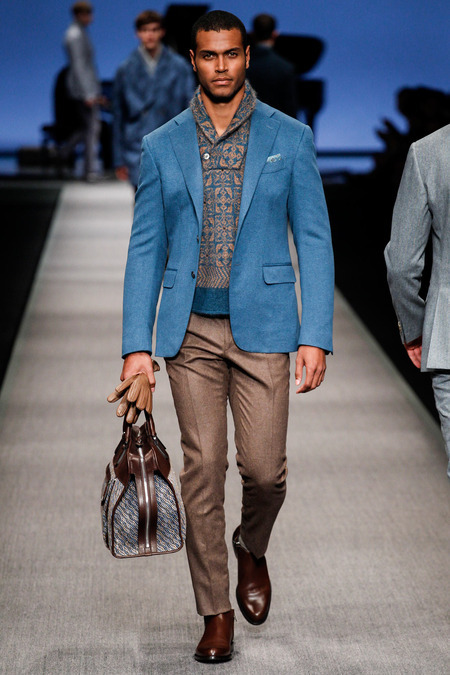 Beautiful color palette from Canali that combines warm winter darks with a soft blue jacket with great fit and accessories to bring a look together that is far from boring. 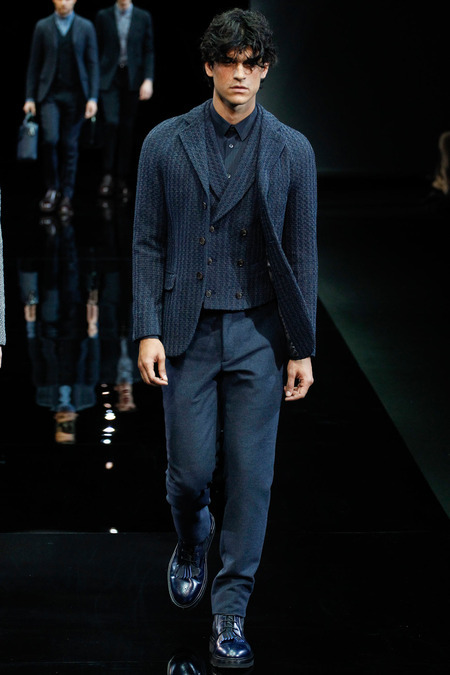 ALL NAVY ERRTHANG from Armani, which is my favorite color if anyone is curious. Lovely knitting on the blazer and DB vest. 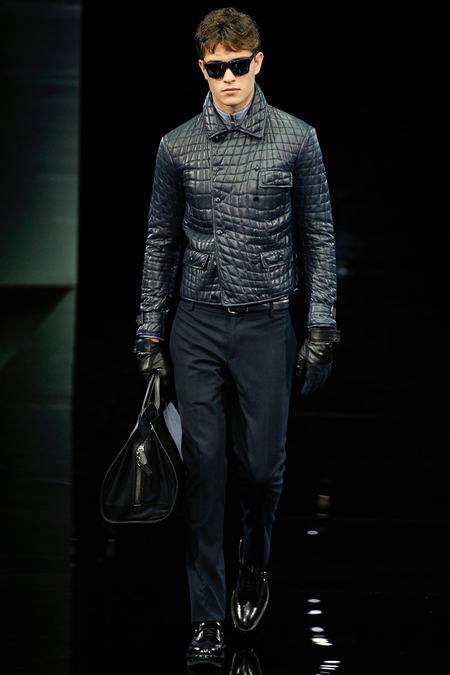 Here Armani tells us not to be afraid to monotone it out every once and a while, just remember to utilize textures to add depth to your look. On the subject of texture, check out this cropped DB leather jacket. I love the stitching, which doesn’t follow any symmetrical lines, it flows with the natural lines created when the jacket is worn. Very well thought out! Phew, we’ve got a ton left, but I’m going to end part 3 here. Thanks for reading!